Last year I fell in love with Green People’s Age Defy+ range. Effective, organic products at a great price. And now they’ve got a fantastic addition to the range. It’s a tinted moisturiser with SPF 15. So it does 3 things and all organically! I remember years ago desperately wanting a moisturiser with an SPF but they just didn’t exist. Then they began to appear but laden with chemicals. If you live in Britain, you may well wonder why you would need such a thing? Trust me you do, specially in summer and also if you’re travelling to sunnier climes. Spring in particular, the rays of the sun are very potent (yes even in Britain) and it takes it’s toll on your skin. I used to wear SPF even in the English winter (still advised by dermatologists) but have now decided to ease up on that due to the fact that Vitamin D deficiency is at an all time high. I’ve never done particularly well with tinted moisturisers I have to say. I like one that’s very light and doesn’t look like you’re wearing make up and have never found one I actually liked. They’re also usually filled with chemicals. 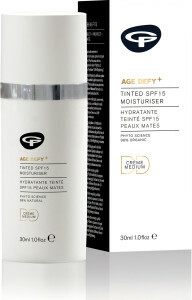 The Age Defy+ Tinted DD Moisturiser SPF 15 ticks all of the boxes for me. It’s organic, gives a very light natural coverage evening tone without feeling like you’re wearing make up, has all the age defying ingredients of the rest of the range and of course, is SPF 15. DD stands for Daily Defense. It uses stem cell technology from the Sea Fennel plant which is anti-ageing, hydrates and offers anti-oxidant protection. It comes in 2 colours: light and medium. Normally I’d be a medium but I found that the light suits me better (well it is the end of a long winter), but in truth it’s so light and sheer that either would look good. Ok I’m going to be honest, I’ve got both! This is a product I’ve been waiting for for a long time! And here it is! I have tried so many tinted moisturisers. But I have to say that I haven’t found one that covers my little red veins on my cheeks. It would be interesting to find out if this one is different. After reading what you had to say about the tinted DD moisturiser from the Green People I decided to give it a try and bought the small sampler pack. WOW……I love it and my skin loves it!! I can only hope that I am lucky enough to win one in the competition you are running…fingers (and toes) crossed!